After the ghastly act of terrorism against a Sikh temple in Wisconsin on Aug. 5, Americans are pondering how to stop gun violence. We have decided that it is, in the words of New York Times columnist David Brooks, a problem of psychology, not sociology. We are trying to fathom the evil ideology of Wade Michael Page. Only several weeks ago, we were all trying to understand the twisted psychology of James Holmes, the man who killed 12 innocents at a movie theater in Aurora, Colo. Before that it was the mania of Jared Loughner, who shot Congresswoman Gabby Giffords last year. Certainly we should try to identify such people and help treat and track them. But aside from the immense difficulty of such a task--there are millions of fanatical, crazy people, and very few turn into mass murderers--it misses the real problem. Gun violence in America is off the chart compared with every other country on the planet. The gun-homicide rate per capita in the U.S. is 30 times that of Britain and Australia, 10 times that of India and four times that of Switzerland. When confronted with such a large deviation, a scholar would ask, Does America have some potential cause for this that is also off the chart? I doubt that anyone seriously thinks we have 30 times as many crazy people as Britain or Australia. But we do have many, many more guns. There are 88.8 firearms per 100 people in the U.S. In second place is Yemen, with 54.8, then Switzerland with 45.7 and Finland with 45.3. No other country has a rate above 40. The U.S. handgun-ownership rate is 70% higher than that of the country with the next highest rate. The effect of the increasing ease with which Americans can buy ever more deadly weapons is also obvious. Over the past few decades, crime has been declining, except in one category. In the decade since 2000, violent-crime rates have fallen by 20%, aggravated assault by 21%, motor-vehicle theft by 44.5% and nonfirearm homicides by 22%. But the number of firearm homicides is essentially unchanged. What can explain this anomaly except easier access to guns? Confronted with this blindingly obvious causal connection, otherwise intelligent people close their eyes. Denouncing any effort to control guns, George Will explained on ABC News that he had "a tragic view of life, which is that ... however meticulously you draft whatever statute you wind up passing, the world is going to remain a broken place, and things like this are going to happen." I don't recall Will responding to, say, the 9/11 attacks--or any other law-and-order issue for that matter--with a "things happen" sentiment. 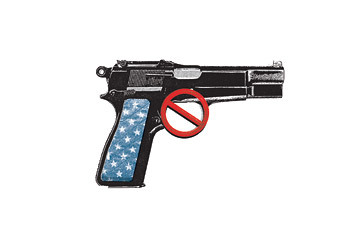 The other argument against any serious gun control is that it's unconstitutional, an attempt to undo American history. In fact, something close to the opposite is true. On Friday, August 10, Fareed Zakaria issued the following statement about this article: "Media reporters have pointed out that paragraphs in my TIME column this week bear close similarities to paragraphs in Jill Lepore's essay in the April 22nd issue of The New Yorker. They are right. I made a terrible mistake. It is a serious lapse and one that is entirely my fault. I apologize unreservedly to her, to my editors at TIME, and to my readers." TIME has since issued its own statement: "TIME accepts Fareed's apology, but what he did violates our own standards for our columnists, which is that their work must not only be factual but original; their views must not only be their own but their words as well. As a result, we are suspending Fareed's column for a month, pending further review."